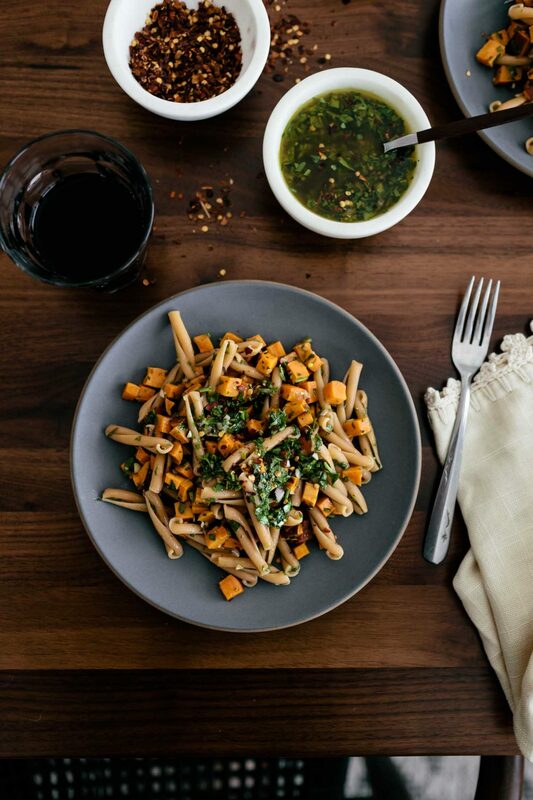 Chickpea Casarecce Pasta with Roasted Sweet Potatoes and Chimichurri | Naturally. When it comes to pasta in the winter, I tend towards pasta with cream sauces or loaded up on cheese. It’s a hold-over from all those snowy days in the Midwest. However, now I occasionally opt for something I can throw in the car for a road trip or work day. 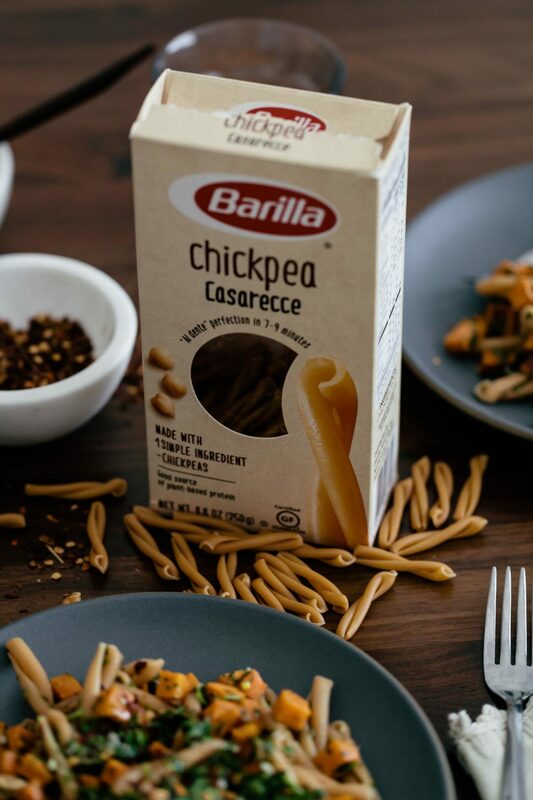 That’s where this pasta comes in with a little help from Barilla Chickpea Casarecce. Roasted sweet potatoes, or not. I recently asked my three-year old why he decidedly didn’t like sweet potatoes anymore. His answer: they taste like garbage. When I posted this on Instagram, there were quite a few people who agreed with him. So, this section is for those people. Swap out the sweet potatoes for roasted squash or roasted cauliflower for the cooler months. During the summer months, you can bet that I’ll be making this with smoked tomatoes and sweet corn. Chimichurri is one of those sauces I batch make because if I’m going to spend time making it, I’m going to make a lot of it. I use it on grain bowls, tacos, eggs, soups, and pasta (like in this recipe). You can make quick work of this sauce with help from the food processor, but I typically just use a knife to chop everything. As I mentioned before in the recipe for broccoli pesto pasta, I love the shape of this Chickpea Casarecce from Barilla. I also love that it’s only one ingredient but cooks up like traditional pasta (holiday it’s shape really well!) While I went with an extra saucy pasta last time, I wanted to showcase the versatility with this dish that’s a bit more pasta-salad than dinner dish. It’s the perfect pasta to pack-away for a work or picnic lunch. 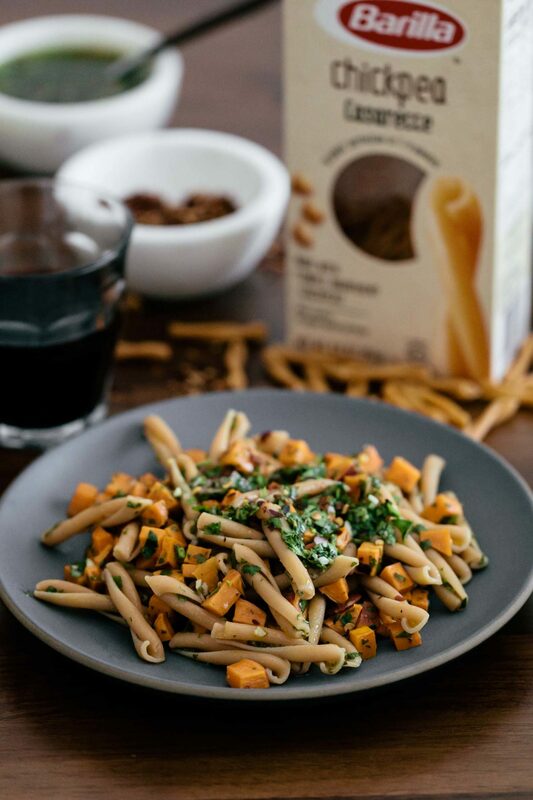 You can find all four varieties (Red Lentil Penne, Red Lentil Rotini, Chickpea Rotini and Chickpea Casarecce) on Amazon. Heat your oven to 425˚F. Give the sweet potatoes a good scrub and cut into ¼” cubes. Place on a sheet tray and toss with the minced garlic, olive oil, and salt. Roast until the sweet potatoes are tender and starting to brown, 25 to 30 minutes. 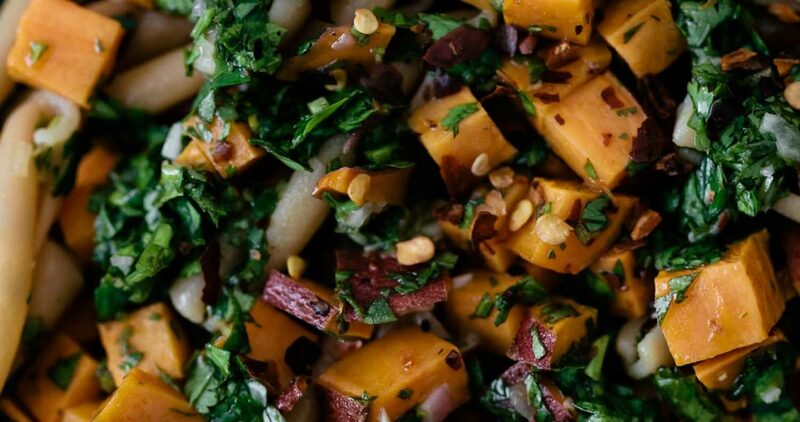 While the sweet potatoes are roasting, prepare the chimichurri. Finally, cook the pasta. Bring a pot of salted water to a boil. Add the Chickpea Casarecce and cook until al dente, 7 to 8 minutes. Drain, reserving 1 cup of the pasta water, and return the pasta back to the pot. 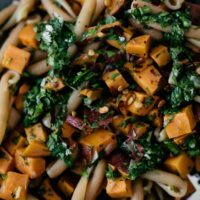 When the sweet potatoes are done, add them to the pasta along with ⅓ to 1/2 cup of the chimichurri. Stir to combine and serve hot. This pasta can also be served chilled. Whichever way you go, keep extra chimichurri on hand- the pasta likes to soak up the sauce and you might need a bit more! 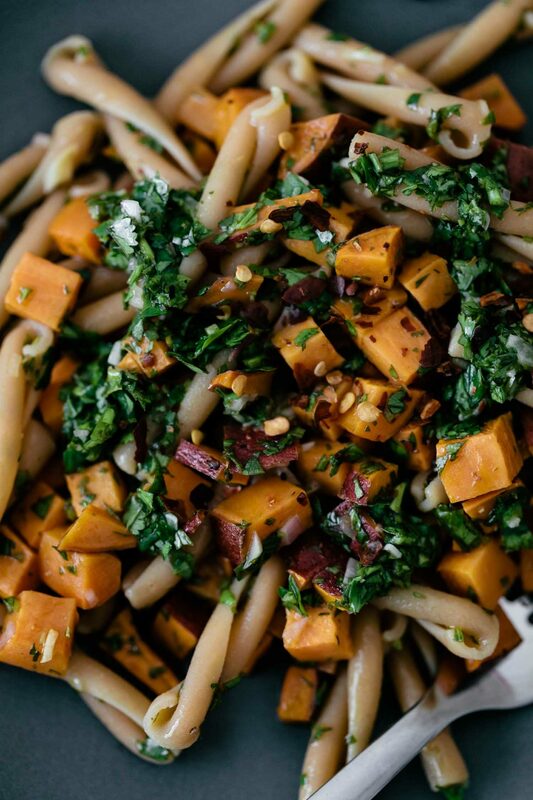 This is my ideal type of pasta – light, vegetable-forward, and herby!